In the two-plus years I’ve been writing Chasing Amazing, I’ve managed to steer clear of talking about the Kraven’s Last Hunt arc, for reasons both intentional and unintentional. I understand that this is a travesty. I know last summer, the readers of Comics Should Be Good (where I guest write the “Gimmick or Good?” feature) named it the best Spider-Man story of all-time. So what are my excuses? When I started this site, I dedicated myself to maintain a laser-focus on the Amazing Spider-Man series of comics, since those were the ones I exclusively “collected.” And because Kraven’s Last Hunt jumps across multiple Spider-Man series (ASM, Spectacular and Web of) I never felt like I had the proper footing to tackle these issues in a way that was meaningful to my blog and its mission. 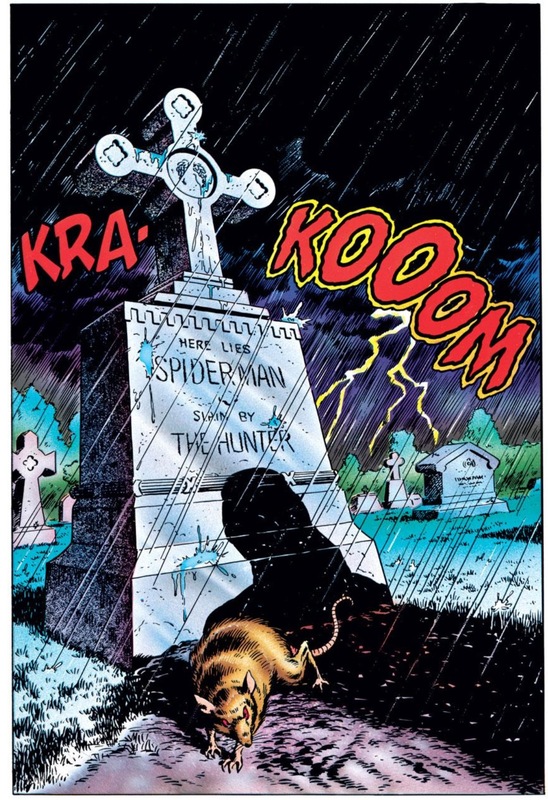 Additionally, I guess there’s a part of me that’s always resented the fact that Kraven’s Last Hunt was one of the first Spidey storylines to crossover through so many titles. Because of this model, comic book buying eventually became cumbersome and expensive for me as a teenager – especially during the overstuffed “Clone Saga.” Having to buy four or five different Spider-Man titles every month just to keep up with what was going on as things moved from “Smoke and Mirrors,” to “the Trial of Peter Parker,” and so on, was one of the main things that drove me reading and collecting for a while (that and the fact the stories stunk!). But I know that blaming such an iconic storyline for the industry’s sins in the 90s is a bit of a reach, and through the power of the Marvel U app on my iPad, I was recently able to re-read this arc without having to comb through multiple short and longboxes in my home to find the appropriate issues. And after reading it again, I realized very quickly than the story shares a lot of similarities and themes with current Spider-Man comics. So what better time than RIGHT NOW, to FINALLY talk about Kraven’s Last Hunt on Chasing Amazing? That scene, coupled with the events of Superior Spider-Man got me thinking about this whole idea of superiority. With both Kraven the Hunter and Doc Ock, it wasn’t enough for the two villains to kill Peter Parker/Spider-Man to prove their superiority. Instead, they both insisted on becoming Spider-Man in order to become his superior. What is it about the Spider-Man character that inspires such a passionate response from his adversaries? Not to always use this idea as a cop out, but I think it all boils down to Peter Parker/Spider-Man’s humanity. Peter, as Spider-Man, is one of the most flawed heroes in the Marvel universe. While there are other heroes like Iron Man, the Hulk or Hawkeye, who suffer from personality defects or personal demons that make them far from perfect individuals, Spider-Man comes across as flawed in a different way. Everything about his existence is accidental – from being bitten by a radioactive spider, to really only entering the life of a superhero because of his own guilt about the death of his Uncle Ben. Of all of the Marvel heroes, Spider-Man still feels like an unfinished product – an individual who is still learning on the job and making mistakes that endanger himself, and loved ones. Kraven the Hunter never knows that Peter Parker is Spider-Man, and seems uninterested in learning. But he’s still haunted by the fact that throughout his entire career as the best big game hunter out there, he’s never been able to bag the Spider-Man. 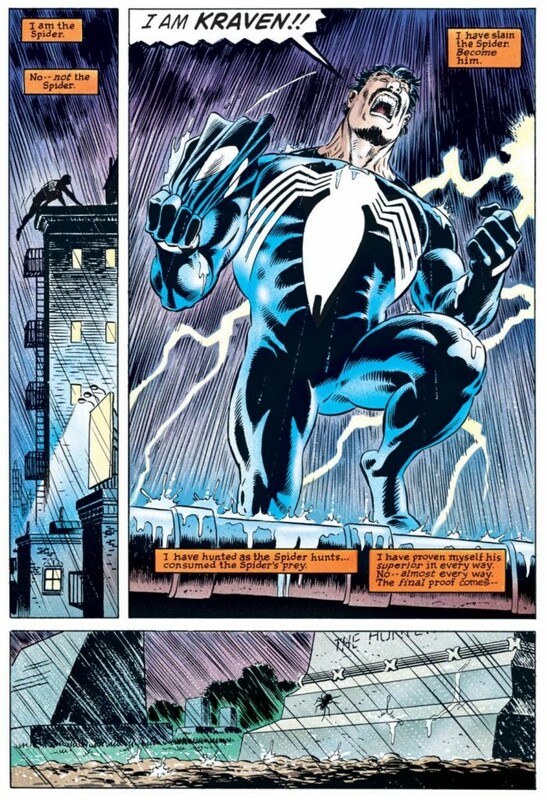 Despite all of Spider-Man’s flaws, someone who considers himself to be the best at something like Kraven can’t overcome him. And I think a big reason why that has continually been the case for Kraven is that he has always underestimated Spider-Man. He doesn’t understand the pain and suffering that has helped shape Peter until he himself is ready to assume his position in the superhero universe. 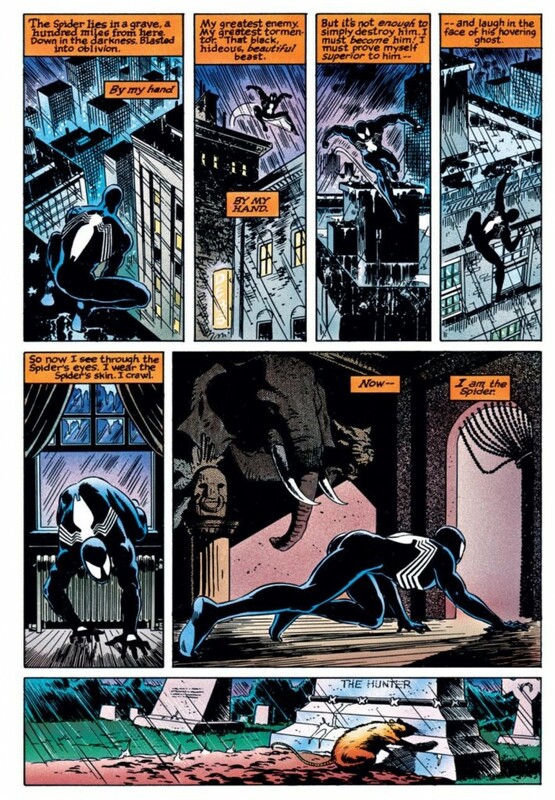 DeMatteis makes it fairly clear why Kraven must defeat Spider-Man: to satisfy his own ego and desire to finally succeed against his bitter rival. At one point in Spectacular #131 he even says it’s about restoring his honor. He starts by beating on a gang of petty thugs, but is still unsatisfied. He decides to succeed where Spider-Man has otherwise failed, by single-handedly taking on the rat-like Vermin on his own turf in the sewers and beating him into submission. It’s not until Kraven has successfully passed that “test,” that he considers his transformation complete. But while Kraven’s descent into “becoming the spider” is absolutely fascinating and an incredibly cerebral show to experience, I’m still unconvinced that Kraven has actually achieved “superiority” in this arc. With Doc Ock, the quest for superiority feels more linear and logical. Stripped of their superpowers, Otto Octavius and Peter Parker are almost mirror images of each other – both brilliant outcasts who have been scorned by their peers. But because of love, Peter has chosen the life of a hero, while Otto has been the villain. But when presented the opportunity to not only be a hero, but become a better hero, Otto jumps at that chance. He sets about being Spider-Man in a different way, but still in the name of power and responsibility. He will physically cross the line because he believes whatever that can be done for the greater good, must be accomplished by any means necessary. And by putting villains like the Vulture or Massacre out of business (or dead), he is directly saving more innocents that Spider-Man would have by showing restraint. Otto is achieving superiority. More than anything else, I think Kraven Last Hunt’s greatest legacy is how it elevated Kraven the Hunter from an almost frivolous member of the rogue’s gallery, into a full-fledge Spider-Man A-lister. 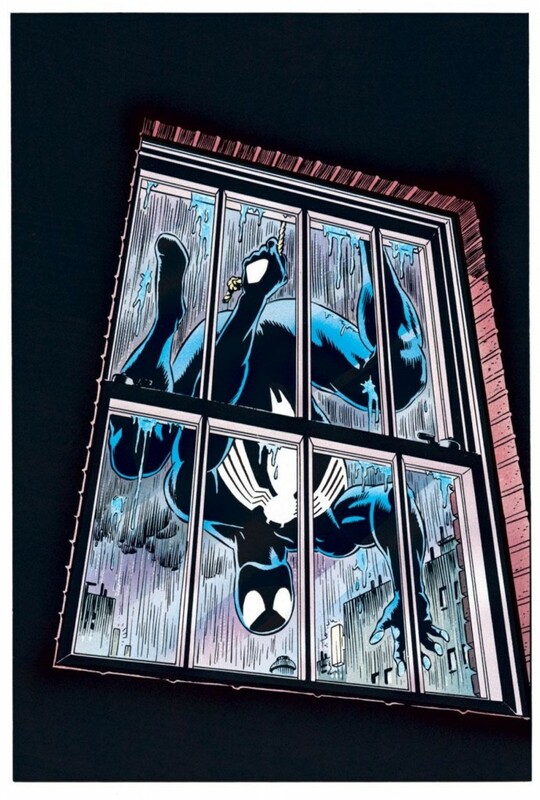 When I go back and read the earlier Kraven stories, while he might have had some marginal success against Spider-Man, the stakes never felt very high when he was in a comic. In the Silver Age, it was Doc Ock, Goblin, Vulture and Mysterio who were the true A-listers. Kraven was the Tarzan wannabe. DeMatties proves in this story that any character can become a superstar if given proper attention, care, and of course, development. There was never such an effort to get inside a villain’s head before in a Spider-Man comic, and DeMatteis does it with flawless execution. But that doesn’t mean I still don’t question Kraven’s claims to superiority.